LADS AND DADS SHARE SPOILS IN 9 GOAL THRILLER! 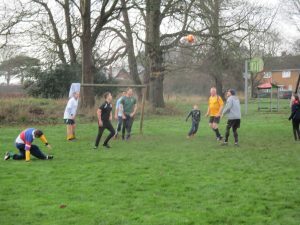 A smiling Boxing Day crowd resplendent in co-ordinating jumpers, Barbour wellies and designer rosettes roared on their teams from a special fenced off “Spectator Area” alongside the neat whitewashed lines of the immaculately marked pitch. They shared home made mince pies, sang carols from song sheets and marvelled at the athleticism and skills of two technically gifted, closely matched and physically imposing sides, immaculate in fully sponsored kits. 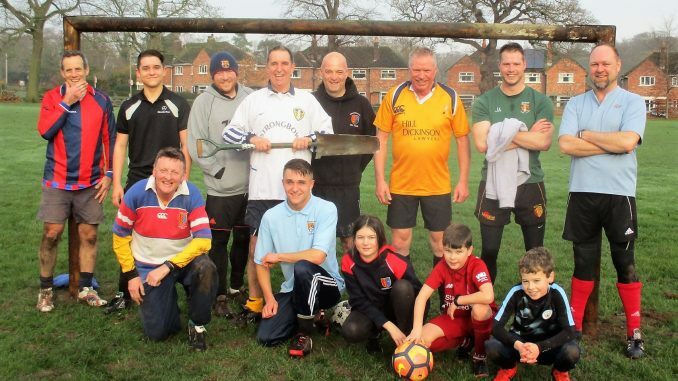 Yes, it was the annual Lads v Dads Boxing Day fixture. In Christleton. Ollie took in the scene, quietly extracted the car keys from the pocket of his faded, well worn rugby shorts (Durham School, 1982), turned up the collar of his Bri-Nylon fake Barcelona shirt and decided to make a run for it. It was only just gone 11 o’clock, he could be back in Barrow without anyone noticing for kick off at 11.15. At precisely the same time Bryn Heard was being firmly coaxed towards Barrow’s Field of Dreams by his Dad, the legendary Sir Nigel Heardwenger (retd). Heardwenger strode up Village Road in his 2001 vintage Leeds United shirt. In his head he was Alan “Sniffer” Clarke, predatory, skilful and like his Leeds teammates of the era, more than a little bit dangerous. A motley group shuffled around outside Heardy Towers, studs clattering on the cobbles. There were the eerily identical figures of Chief Armstrong and his son Jonathan, ostensibly on leave from HM Service but actually researching the growing influence of fake Yorkie Russians on Barrow village life. Then there was Midshipman Phil “Beckenbauer” Smith and his lad Marcus, fully decked out in the latest Liverpool kit and Gordon Highlander “Jinking” Stuie Mochrie with a keen but slightly nonplussed Sophie. With his own lad in the Far East and unavailable, Lance Corporal Andy “Dip the Shoulder” Porter had adopted a Heard for the morning in order to qualify for selection. Let’s face it, there are plenty to go round. Ollie reflected on what have been. He had been specially invited by “Big Carl” as a guest to join the Christleton match, a highlight of his career. He could have been nibbling on the half time smoked salmon and cucumber sandwiches by now, and sipping a refreshing mint julep, but there again Big Carl or one of those semi-professional Peel lads might have killed him. He was safer here, in the earthier, less sophisticated confines of Barrow. With the posts in position the match kicked off and the Dads assumed a 1-5-1 formation in the Mourinho “park the bus” tradition. Rackham played goalkeeper in the modern style, carrying from the back, with Heardwenger in his usual place hovering around the 6 yard box. In between them Armstrong, Mochrie, Smith, Evans and Porter ran into each other and hoofed it hopefully through the long grass. Despite going a goal down the lads soon realised that the match was theirs for the taking. Armstrong Junior was an impressive presence, both between the sticks and in midfield shaking off the attentions of a mostly prostate Porter who played much of the game from a semi-comatose lying down position. The Heard Boys busied themselves linking play alongside Sophie who effortlessly found space along the Bowling Green wing in the area that should have been occupied by her father. The Academy lads Evans and Smith showed that they had inherited none of their respective fathers’ worrying tendencies to either wear tights or go AWOL when defensive duties were needed. The game ebbed and flowed, with the regular supporters briefly joined by a Lance Armstrong lookalike carrying a brace of dead squirrels in his cycling knapsack. Riverdance Walsh provided the half time entertainment with a precise and well executed Flossing routine at the Manor House gate entrance. 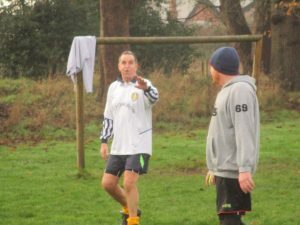 As the clock approached 12 Barry added a welcome Health & Safety note by skirting the pitch in a Hi Viz tabard glancing suspiciously at the newly erected posts. Despite being the most visible moving object on the field he was accidentally bundled into touch by an over enthusiastic Mochrie and took refuge under cover in the shrubbery by the bowling green, muttering a stream of expletives. 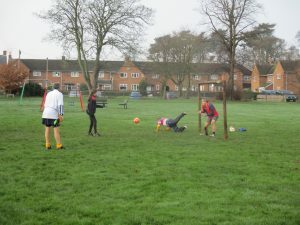 Despite 6 minutes’ of “Next Goal Wins” extra time the Dads missed a succession of straightforward chances to clinch the match. 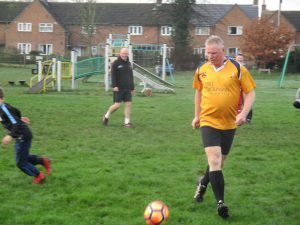 At one stage the excesses of the previous day kicked in and the Dads froze completely, “walking football” had become “standing football”. 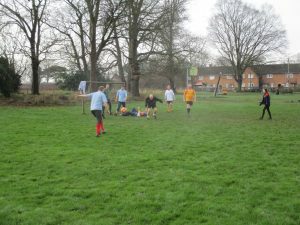 With a final penalty conversion the lads secured a 6-3 draw. 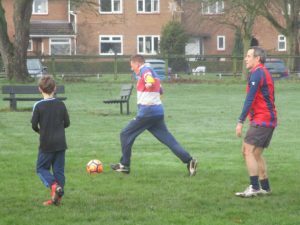 It had been a contest in the best traditions of the Barrow Boxing Day fixture. The posts had stayed up and there were no major casualties. Ollie’s dream of being embraced by the Christleton elite remained elusive. Joint Men of the Match Marcus Smith and Leo Evans along with Woman of the Match Sophie Mochrie had set down a marker for the next generation. 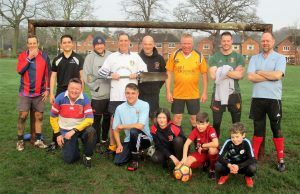 Far from the excesses of the Premier League and the cucumber sandwiches of Christleton real football is alive and well with a bright Barrow future.